Every family has a few recipes they are famous for – that they get asked to bring to potlucks and write down on notecards over and over. In my family, three in particular come to mind: pumpkin pie, hot fudge sauce, and beef stew. I’m pretty confident in the kitchen and don’t usually like to tether myself to recipes – trusting my tastebuds above all else – but in this case, I pull out the cookbook. 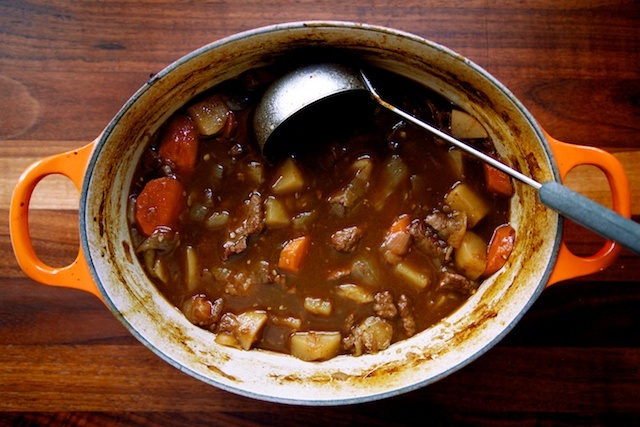 This stew has a lot going on, and it has to be just so. 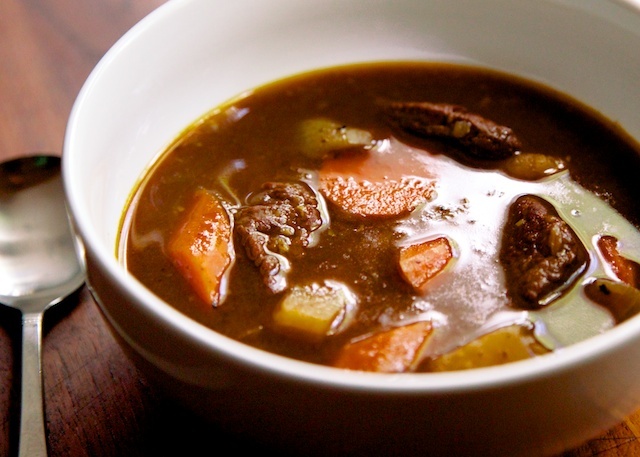 The foundation of any good stew is meat, browned enough to coat the pot in caramelly brown “fond” and anchor the dish in succulent complexity. 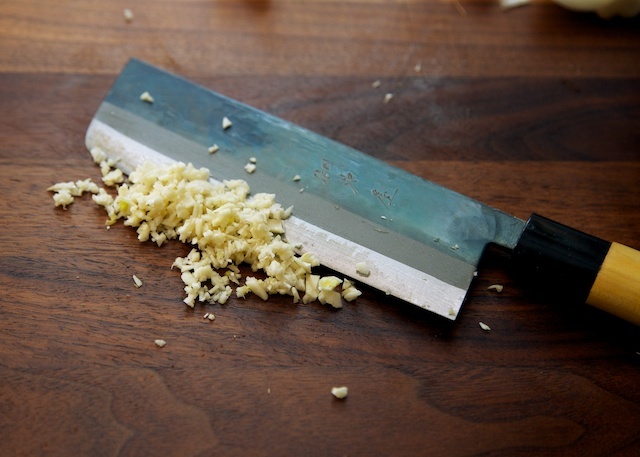 Next come aromatics – onion and garlic, cooked in fat while scraping important brown bits back into the mix. A dusting of flour will give the liquid some body. The main reason I need to look at the recipe when I make this dish – there are lots of spices. Especially cloves and paprika – but also pepper and sugar and worcestershire and lemon juice and bay leaves and you get it. My favorite part of the recipe: walking away for a couple of hours. And while you were away, stew happened. 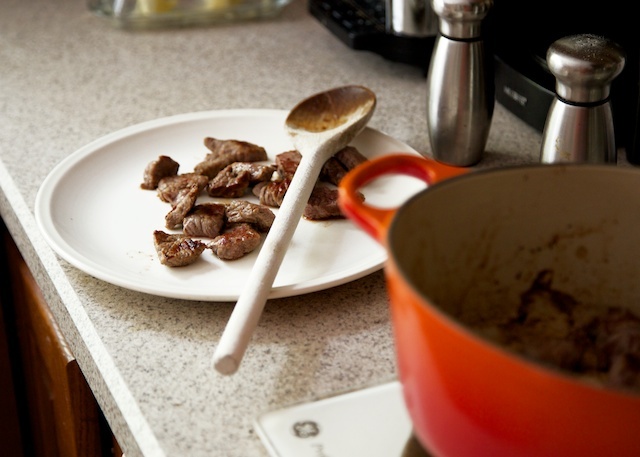 -Coat meat in oil, brown over medium high heat, working in batches (at least two or the meat won’t brown properly), set aside. 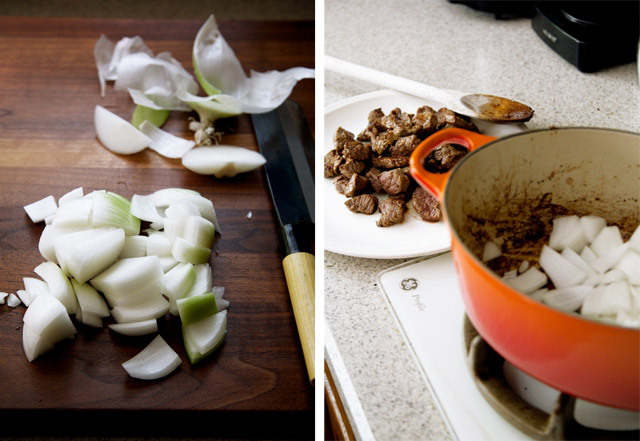 -Add another tiny bit of oil to the pot, and cook onions and garlic until slightly browned (throw in a little beef broth if things start looking burny instead of brown). 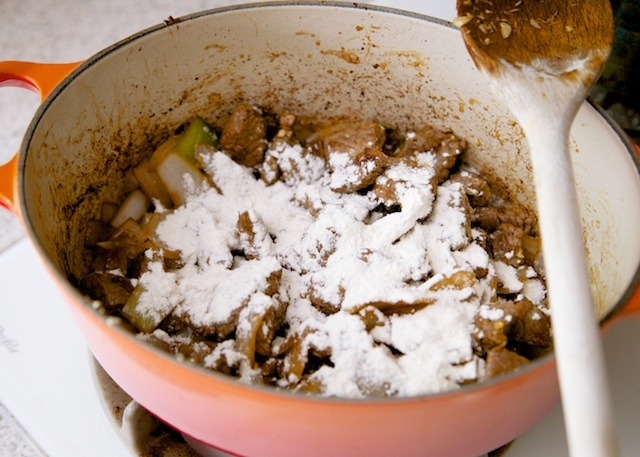 – Add meat back to the pot, dust with 1/4 cup flour and stir while cooking for a minute or two. 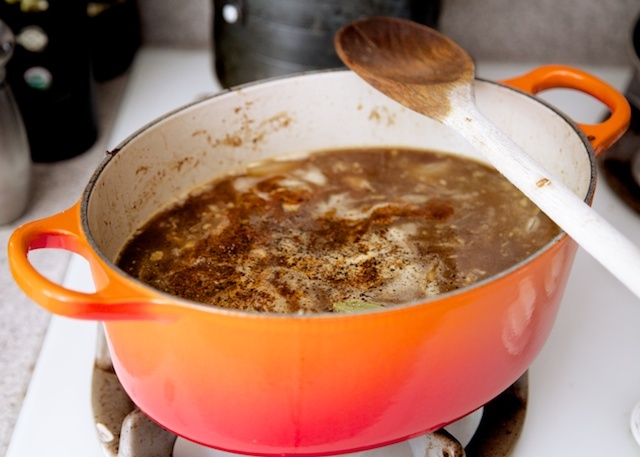 -Add 1 qt beef broth and all ingredients from lemon juice down to salt. Bring to a boil and reduce heat to low. Simmer one hour. 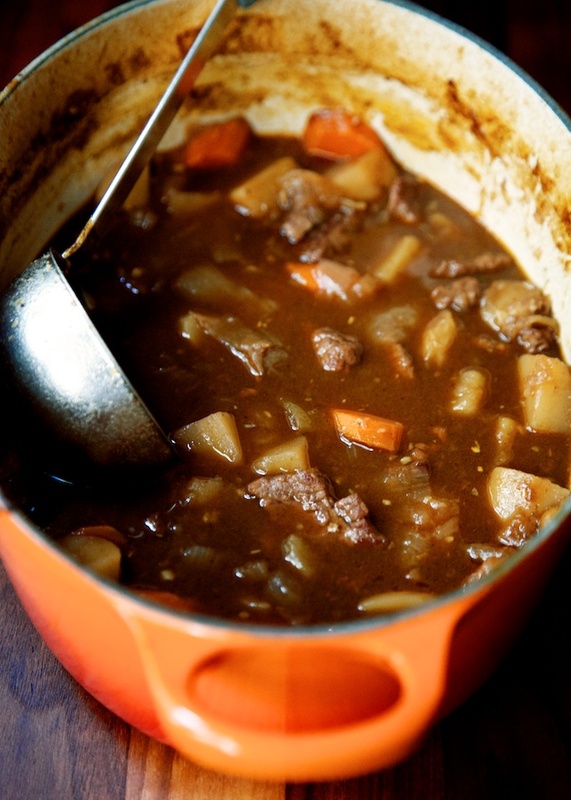 – Add carrots and potatoes and additional beef broth if necessary to cover vegetables. Cook 30-40 minutes or until potatoes and carrots are tender. -Taste for seasoning and serve. Looks wonderful! 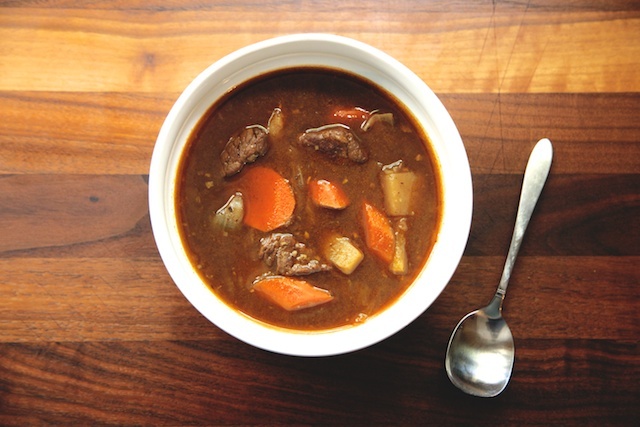 Please tell me what beef broth brand you use! Judy, thanks for comment! My mom uses Knorr bullion, so thats the flavor I'm most familiar with, but I usually use boxed Swanson or Wegmans brand broth and the end result is just as good. Use what you can get and taste for salt before you serve it. The biggest difference I notice between bullion and different boxed broth brands is the salt level. looks very delicious!!! make me hungry!! oh! Is knife made from Tanegashima? Could I use baby carrots if that is what I have in the Frig? If so, would I still just measure out 2 cups? Absolutely! I sometimes cut my baby carrots in half at a diagonal, but it's just for presentation.